Enjoy unlimited made-to-order, hand-crafted espresso beverages at your next event! As the largest and longest operating espresso catering company in the nation, we take pride in providing you with professional service, highly experienced baristas, and the best quality espresso for your important event. Exceptional customer service, genuine hospitality, a passion for coffee and being a local family-owned business is at the heart of what we do. We look forward to serving you! Our full-time event planners are available to help you customize your espresso catering service to enhance the experience of your guests! Interested in our espresso catering for your next event? Contact us today! We serve Seattle, Portland, Bellevue, Redmond, Everett, Tacoma and surrounding areas in Washington and Oregon. Thinking about a potential espresso service? Request a quote for in depth pricing! 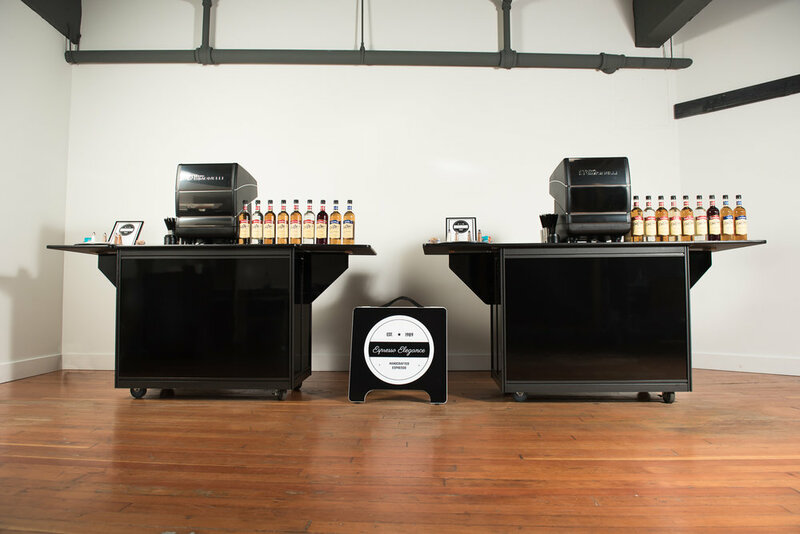 Espresso Elegance™ Catering is the top choice for mobile espresso carts in the greater Seattle and Portland metro-areas! Our goal is to make you look good to your guests and to make the event planning process a breeze. Your event is important to us and we look forward to providing you with a flawless espresso service. Please contact us at info@espressoelegance.com for more information! Sample of options to order at your event - featuring our signature drink, the Vienna Cubano! Feel free to order one of the below options at any Espresso Elegance service! In addition to these standard drinks, we also provide a seasonal specialty drink menu at every event! Keep scrolling to see our flavor options. We can always make sugar-free, non-dairy, decaf, and non-coffee drinks as well. We have a variety of syrups available by request, please do not hesitate to ask about your favorite flavors! Have a quick question? Check out our FAQs page!